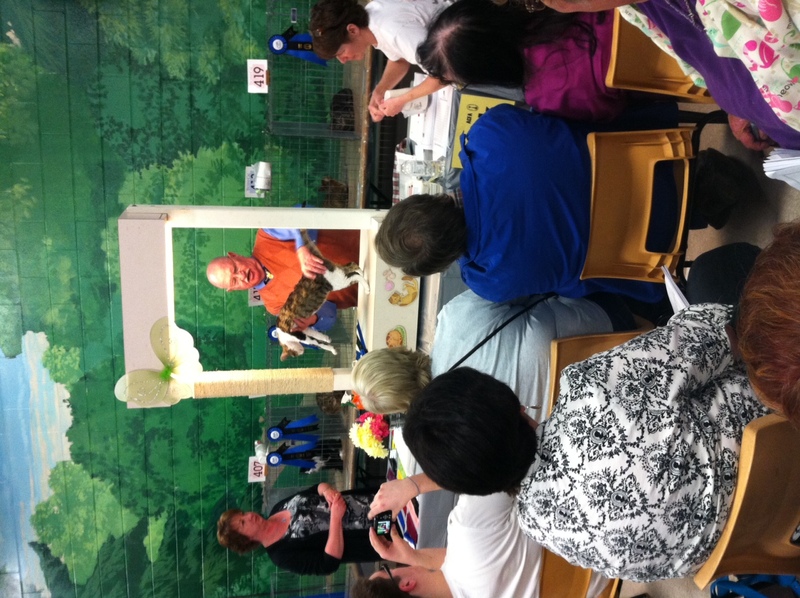 As previously reported the 42nd Annual Bluenose Cat Club Cat show recently took place. Naturally we had to go to see what the fuss was about. So along with our lovely friend Ben ( Of No Ordinary Roller coaster fame) we went boldly where (we think) no local bloggers have gone before. Every preconceived notion of what to expect at a cat show was true and then some. Even days after the event we are having a hard time wrapping our heads around what we witnessed. Bald cats, awesome cats, leopard cats, cat outfits that not even your most cutting edge Northern Getaway outfitter could not have imagined. This was hands down the best 5 bucks we’ve spent in a while. The show was held in a large room with show rings lining the outer walls, and rows of various cats in the middle of the room. Each cat was accompanied with their owners who ranged from little kids to 42 year cat show veterans. As we walked through the various isles filled with cats we attempted to make contact with some owners. 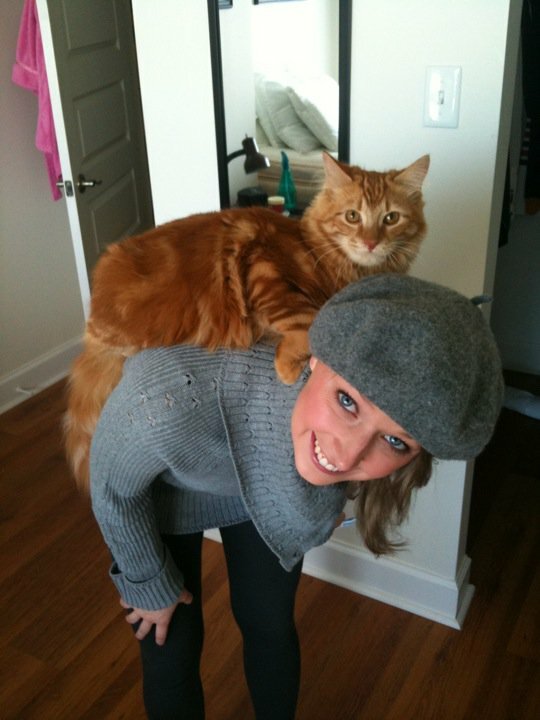 Little did we know our NYC Cat Judge inspired outfits did not bode well with attendants. We stuck out like sore thumbs and just like the siamese cats in Lady and the Tramp we were snubbed. Did we want to talk to the lady with the wicked cool Abbysinian cat with an amazing show cage? Of course we did. But alas, she wanted nothing to do with us. We figured it was best to take a lap, see what was what and then settle into a judging ring to learn the inner workings of this world. Fiercely real plus size model. I can has cheezeburger? 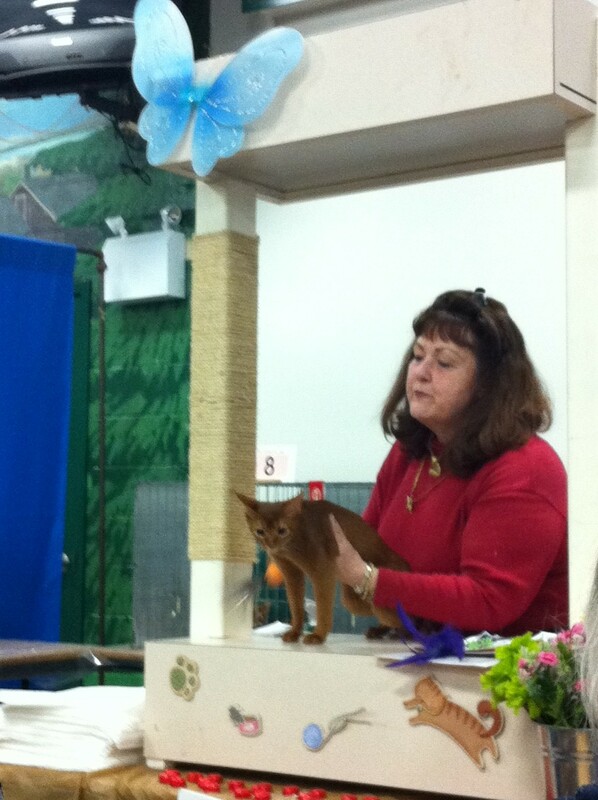 Cat judge shows off the beautiful Abyssinian. Eventually we cornered international cat judge Ron Summers. Ron – who oddly enough is allergic to cats – has been judging cat shows for over 20 years and came from Indiana to judge this particular event. We had a lot of questions for Ron and thankfully he took us under his wing and taught us a thing or two to prevent further embarassment at future cat shows. We mentioned our “orange tabby” Freddie to Ron to break the ice. He looked at us as if we had showed up late for a go-see on America’s Next Top Model and said “No…..no..those don’t exist. I think you mean red. 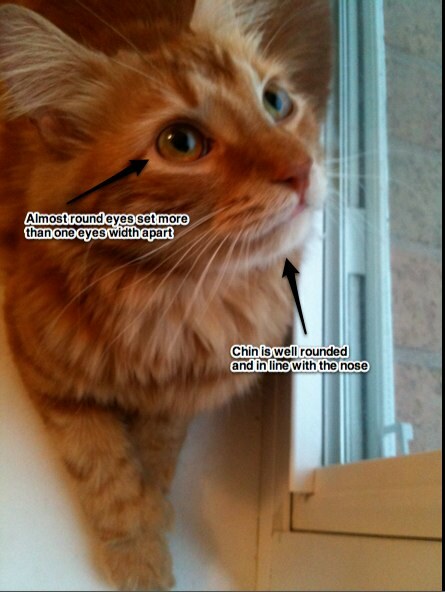 You have a red and cream tabby. And by the way there are no such thing as grey cats. Only blue.” Well now we know. 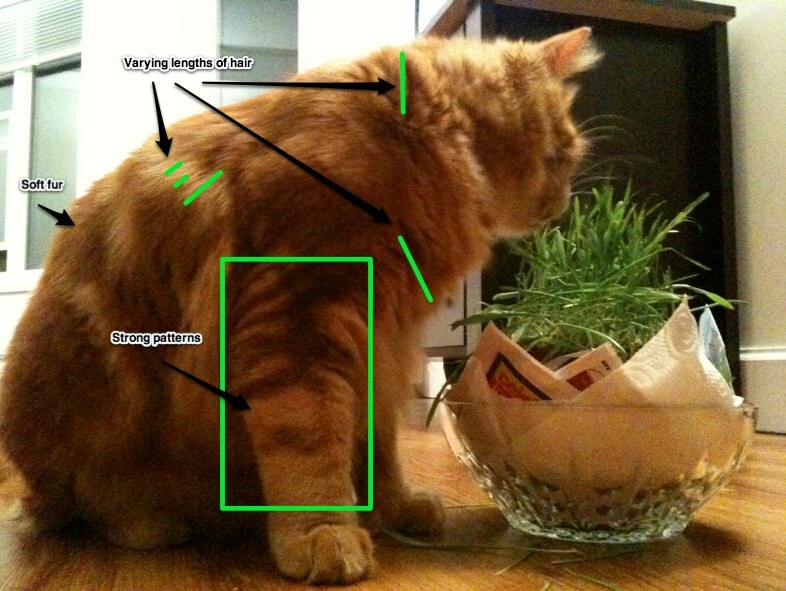 Rons love for judging cats inspired me to take a look into the rules and regulations and what exactly makes for a great looking cat. I think we owe it to our readers to take a harsh look at our very own Freddie and see just how he would match up against the most fierce competition. 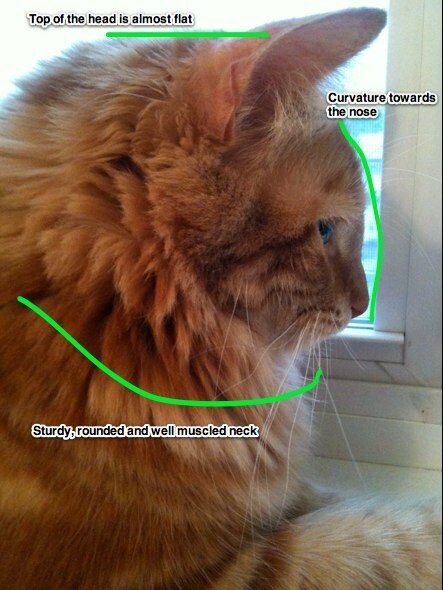 Because Freddie is an adopted cat we had to do some preliminary research on what kind of cat he is. 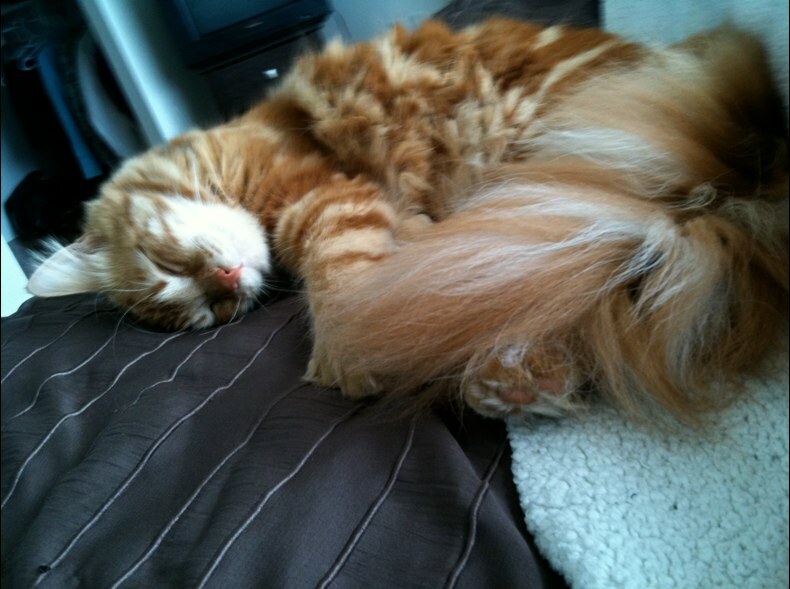 After much investigation we came to learn Freddie is a Siberian Red Tabby. No score but pleasant cats win hearts. Freddie’s score: Winning 100% of hearts since 2010. Unfortunately genetics have dealt Freddie an unlucky card costing him any chance of winning Top Siberian Cat at the 43rd Annual Bluenose Cat Club Cat Show. In this category Freddie would be….disqualified. For what you ask? EXTRA THUMBS. Freddie’s winning assets actually cost him elimination in our mock judging. 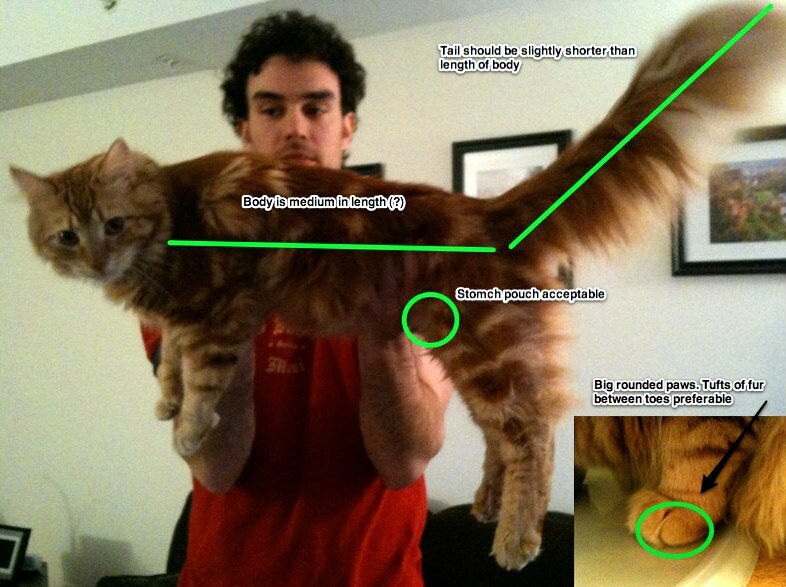 Lucky for him he can enter in the domestic house cat category and likely crush the competition. 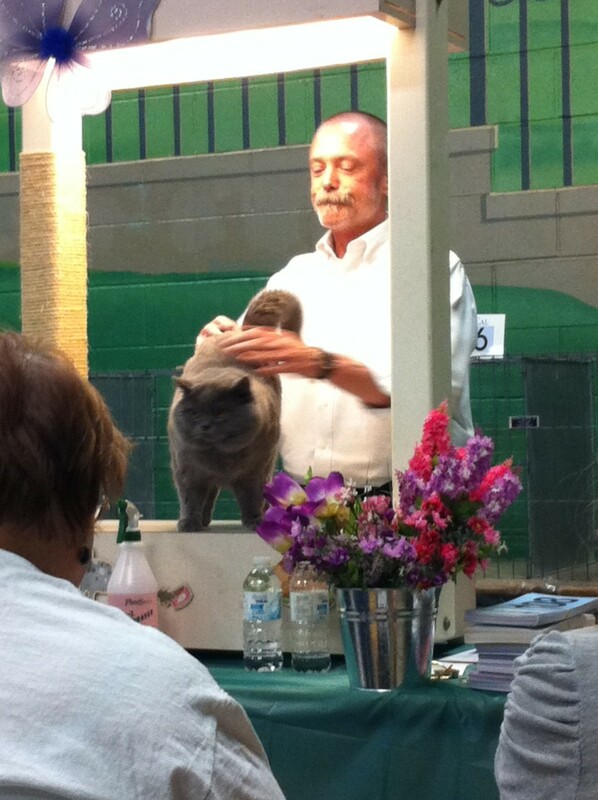 Needless to say the 42nd Annual Bluenose Cat Club Cat Show was quite the experience. We had our eyes opened to world we only thought existed. 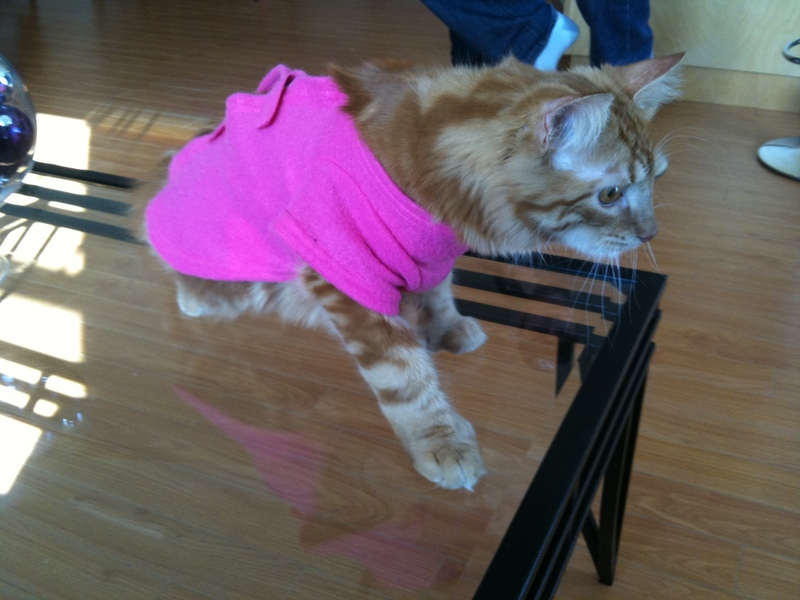 And beyond the lack of cat fashion show, we give this cat show 0 thumbs up. Because if we gave it two we’d be disqualified. 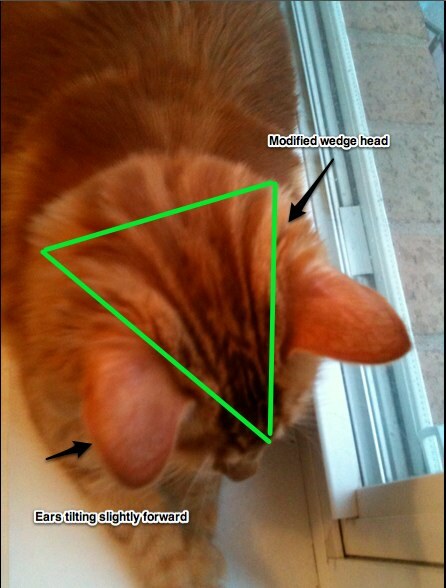 Veronica Corningstone delved into the unknown when she covered the first Cat Fashion Show in 2004. Before then cats everywhere were forced to keep their love of fashion, tricks, treats and kitty litter behind closed doors. Lucky for us the 42nd Annual Bluenose Cat Club Cat Show is upon us. On Saturday we will be breaking ground as local bloggers looking to gain insight into what makes a cat show popular enough to have been around for over four decades. I’m going to be completely honest here. We have no idea what to expect. Is this Westminister Kennel Club style where cats on leashing will be prancing about? Will they be in clothes? Will there be tons of people wearing long skirt suits from 1980 or will the fashions be more along the lines of Northern Reflections circ 1994? So check back next week for our exclusive look at the 42nd Annual Bluenose Cat Club Cat Show. It’s sure to be the cat’s meow. If you haven’t seen HBO Canada’s hit show Less Than Kind you’re seriously missing out. The comedic genius of Mark McKinney ( Of Kids in the Hall and Saturday Night Live fame) paired with the creative mind of the late Maury Chaykin created a hit series that has won some serious critical acclaim. We at This Needs to Stop had the chance to sit down with Gemini Award winner Benjamin Arthur who plays Josh Blecher in Less Than Kind. Less Than Kind is a sitcom following the Blechers, a quirky jewish family running a driving school in Winnipeg. Ben plays Josh Blecher – a wannabe actor returning to Winnipeg after a failed attempt at an acting career in Toronto. Check out our interview with Ben that covers everything from the stars whose height will shock you, the worst advice he’s ever been given, and his encounter with his elementary school janitor that shaped his future. A huge thanks to Benjamin for taking the time to chat with us!! *Disclaimer: To capture the interview via Skype we had to use a trial screen recording program. We will look to increasing video quality in the future. Categories You're doing it right. The girls all have birthdays coming up (one each month, for the next three), so I thought this would be a good time to do a post I’ve wanted to do for a while. Girls, this counts as my birthday presents to you. The Bee’s Knees: The Girls of This Needs to Stop. Last summer Sarah Carver, Amy Wheaton, and Sylvia Creamer were talking on Twitter about starting a video blog about Gossip Girl. That, my friends, is how all this silliness got started. Amy and I had worked together at an ad agency and became friends, Sarah and I were working together at a software company, and Sylvia worked with my former boss and friend, but she and I hadn’t really met officially (beyond a “hi, how are you?” in passing once or twice). But I knew she was cool. And I also knew that if these girls got together and worked on a project together, it just *had* to be awesome. So I volunteered to help them with their Gossip Girl show. And it was so much fun. We all became great friends. And they’re basically the coolest people I know. Amy can throw out a one-liner like nobody’s business. She’s an amazing writer and a caring friend. When we used to work together Amy and I carpooled (well, I hitched a ride with her because I’m a moocher), and our drives home after stressful days were some of the most fun I’ve ever had. Amy saw me at my worst when we worked together (stressed to the point of anxiety attacks from work, plus a completely screwed up personal life), but she was always awesome about everything. I’ll never forget that. Sylvia is distilled sunshine. Or something like that. She’s a super positive and motivated force in our group (which makes her pretty unique). She just makes things happen. When anyone else would just say “you know what would be cool?” or “we should totally do that,” Sylvia just does it. She just makes it happen. She’s the glue. She’s hilarious, has crazier stories than anyone I’ve ever met, and just makes days better. I’m excited that I’ve only known Sylvia for a few months, because it means we’ll only become better friends as time goes on. Which I feel pretty lucky about. When Sarah started working at the company where we met, within about two days I’d decided that one day we would be best friends. I don’t really know what it was that made me think that, but I just sensed that, yes, we would be friends. And I’d say within about two weeks we were real-life friends, not just coworkers. And we’ve only become even better friends, everyday. She’s absurdly funny and has mannerisms and ways of talking that I have straight-up stolen from her because I love them so much. And I once made her laugh so hard she spit out a Teddy Graham. So, happy early birthdays to Amy, Sylvia, and Sarah. You guys rock.